Talking can feel pretty awkward at first, until you become accustomed to your new teeth. This will be true whether you have a full denture or partial. Even if you have the best dentures available, you're still likely to experience changes or difficulties in your speech at the beginning. For example, you might have trouble pronouncing S’s and F’s, and your dentures might make clicking noises or shift while you’re speaking. 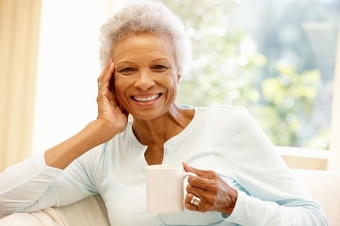 The good news is that you’ll get used to your dentures over time, and with a little practice you’ll be feeling perfectly comfortable when speaking again. Often the sound of your voice is increased or altered by dentures because they change the anatomy of your oral cavity. When you spoke before you had dentures, vibrations travelled through the bones of your jaw and skull, but now with the dentures in place that’s going to sound a bit different. Try to remember that the difference is much more noticeable to you than to anyone hearing your voice from the outside. If you find that you make clicking sounds when you talk, try speaking more slowly. This will help to prevent additional movements that lift or shift your lower denture. Keeping the lower denture stable requires help from the muscles in your lips, tongue, and cheeks, and this is going to take some practice. It's a good idea to bite down gently and swallow to make sure your dentures in their proper position before you begin speaking. If you find that your dentures frequently slip out of place you can try using a denture adhesive. Your dentist can recommend one that's right for you. Read out loud, and practice speaking when you’re alone. Remember to repeat words that you have trouble pronouncing. You could even have fun talking to your pets. Daily practice will help you speak with confidence. If you have questions about talking while wearing dentures, please contact our Langley dentists today to book a consultation.